We were up at 5:30 a.m. to go to Bradford for an 8:15 and 10:30 service. Dad will be preaching there quite often, earning vacation money! We hope it won't be too long before they can get a new pastor. There have been problems and they will continue for awhile. Only about 15 in the Church School, less than Hessel Valley, and both services are poorly attended. Dad was hoping they'd just have one service but they want to continue this way. It isn't that bad getting up early and we hope it won't be too bad a winter. With this extra money we will be able to eat out next summer at the lake and that is what I love! Last Sun. 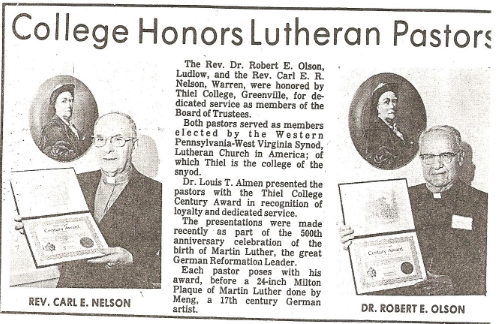 we were at Thiel for a special Luther Sunday and we enjoyed that. 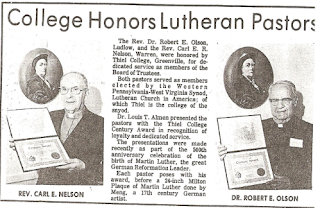 Dad, along with other former board members, were honored for his services to Thiel. We were at a special dinner and that was interesting as well as delicious. The cream of the crop was there!!!! Next Sun. we will be at Bradford all day as there is a special evening service commemorating Luther's birth and it wouldn't be worth it to come home. We will probably go to Olean and eat there at The Castle. Dad, as one of the former district pres., will be assisting at the Communion Service. Your father has been a capable leader. Barb is doing fine and it is nice to have her home. Only I am corrupting her!! She is watching some soaps on TV as well as other programs and she is trying to win a million in the lottery. Isn't that shameful. She put in an application to work at Betty Lee during the Christmas season and she hopes she will get a job. She could also invest in some clothes with her earnings. We have done some shopping and I've bot her Christmas gift - a blazer. She found one she liked. Also some jeans. She is surprised at the nice things B. L. has. Also surprised that Warren is so nice! She might even stay longer and go to the lake with us in Aug. Time will tell. It is working out fine. I have started the ball rolling concerning my retirement I'll get from working. Filled in a retirement form and it sounds like I could get about 130.00 mo. which would more than cover Blue Cross that I can get thru the school and nit is cheaper than what Dad could get thru the church. I would also take the amt. I contributed and take retirement on the state and school district contribution. With S.S. I will have some spending money. Dad built a bookcase for the little room for his books that have been in the attic. Lar went to a turkey party last nite and won a 10LB turkey. Not big enough for Thanksgiving so we might have it sooner. I'm hungry for turkey, stuffing, etc. I'm taking Tues. off and we plan to go to Buffalo as Barb would like to see Niagara Falls again and we will go to some Malls, at least one.